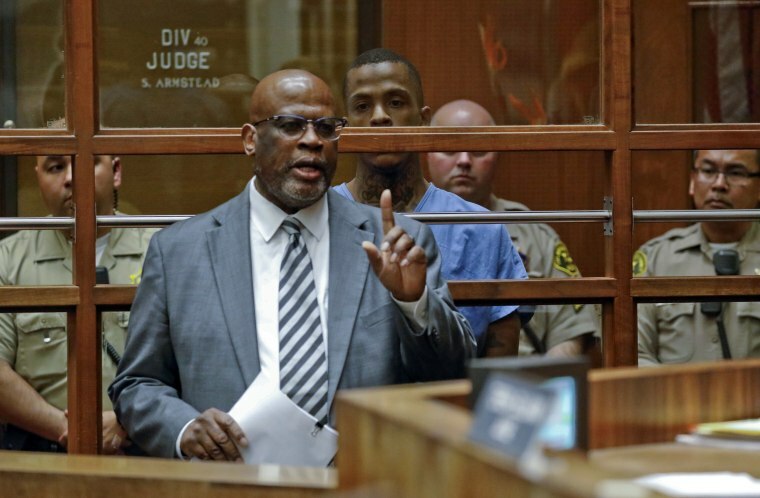 "Instead of attacking me and others who have nothing to do with this case, channel that energy toward continuing Nipsey’s legacy," Jenee Darden said. Christopher Darden became a household name when he helped prosecute Simpson in 1995 in the brutal murders of his former wife Nicole Brown Simpson and her friend, Ronald Goldman. Simpson was acquitted. The Grammy-nominated rapper and community advocate, born Ermias Asghedom, was fatally shot outside his clothing store Marathon Clothing, in Los Angeles on March 31. The shooting left two others wounded. Jenee Darden, who did not return NBC News' request for comment, said she will continue to pray for Hussle's family, and that she hopes peace and justice prevail. Several days ago, she shared a photo of Hussle and his longtime girlfriend, model and actress Lauren London. "I feel bad Lauren London is going through this," the caption reads in part. "As she grieves, she has to be strong for her children. I hope she has support."